What did Everett really win? 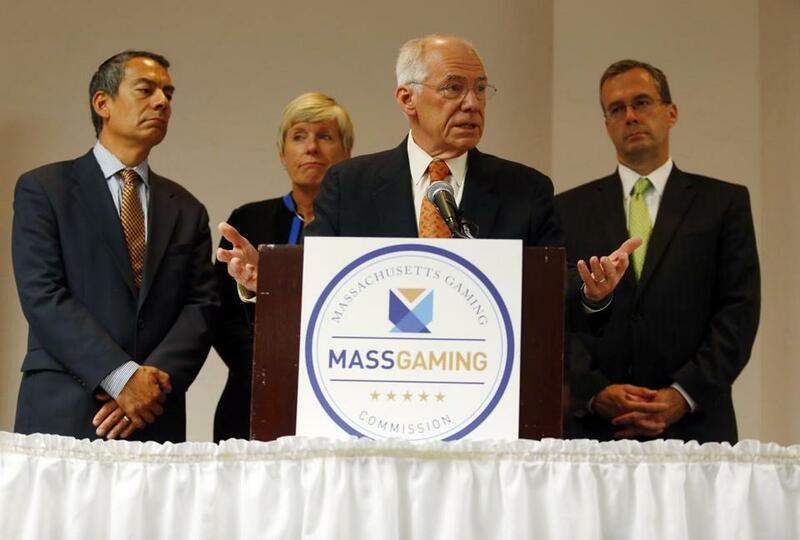 Members of the Massachusetts Gaming Commission addressed reporters Tuesday after awarding Wynn Resorts a casino license. On the same day a fourth casino in Atlantic City shut its doors, Massachusetts welcomed its first one to Greater Boston. The vote to issue a license to casino mogul Steve Wynn came with the industry’s standard pledge to transform a downtrodden metropolis — in this case, Everett — into Emerald City. Just let Wynn construct his signature bronze towers on a contaminated slab of land, and cash, jobs, and magic will flow from the banks of the Mystic River. That was supposed to happen in Atlantic City. That it didn’t is now blamed on too many casinos in one location and the growing competition from neighboring states. Boston is different, casino backers insist. It’s not a destination for the desperate. It’s the cradle of liberty and libraries, a modern Mecca for academics and entrepreneurs. People already want to live, work, vacation, and spend their money here. With the dowdy, old Puritan-influenced crowd increasingly replaced by hip, young fun-seekers, a casino in nearby Everett is a sure bet. Right? Take a look at the location on the banks of the Mystic River. Wrong. Watching the vote go down did nothing to change a skeptic’s mind about inherent risk. For one thing, “risk” was a major theme of the selection process, as state gaming commissioners weighed Wynn’s Everett proposal against Mohegan Sun’s proposal for Revere. Everett was the choice, because of Wynn’s deep pockets and his promise of more, higher-paying jobs. But as commissioner James McHugh pointed out, Wynn’s project still needs critical state and local permits to proceed. “My concern is what do you do about a very good proposal that has a high risk of not being able to get off the ground? ” said McHugh. What you do is approve it, 3-to-1, with only McHugh voting against it. Formal approval came the next day with a 4-to-0 vote. To be fair, the financing risks associated with Mohegan Sun made it equally hard to embrace. If only someone, like perhaps Boston Mayor Marty Walsh, urged the commission to approve neither proposal, maybe the casino story in Greater Boston would have a different ending. But no one wanted to stand up to an industry that put untold millions behind their cause — nor stand up to those powerful union forces supporting it. The Everett decision was announced at the Boston Teachers Union Hall, a worn setting at odds with the glitzy image that casinos prefer to portray. But the locale was a good reminder of labor’s unrelenting push for casinos in Massachusetts. Unions covet the construction jobs and service positions related to the gambling industry. The thousands of Atlantic City workers who are watching their jobs and paychecks disappear as casinos go bust are not part of this vision. But that’s because casino backers never let reality get in the way of mythology. It’s a cliche to say the house always wins, but it does. The risk, as always, lies with the customer who rolls the dice. Time will tell on DeMaria’s prediction. But there are already certain winners. After the vote, Steve Tocco, the CEO of ML Strategies, Wynn’s lobbying firm, exulted in a victory he said was 10 years in the making. He worked, first, to get the state to pass the casino law, then for the last seven years, on Wynn’s behalf. When it comes to billable hours, Tocco and friends already hit the jackpot, with a bigger one to come, given the permitting challenges ahead. It’s a cliche to say the house always wins, but it does. Wynn will be fine, even if voters in November choose to repeal the casino law. What he loses here, he’ll make up somewhere else. The risk, as always, lies with the customer who rolls the dice. If casinos go forward, Massachusetts will soon find out if it is as special as it thinks it is.